During a recent lesson in science, the students in 3rd grade explored the concept of force using the game “Tug-of-War.” Teams were created to answer a testable question. 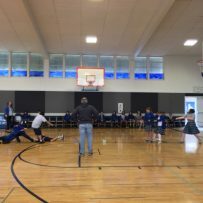 For example, a student wanted to divide into boys vs. girls to test the question “Who is stronger, boys or girls?” The students then competed in a game to test their scientific questions. It was a wonderful way to learn about the concept of force and the scientific process while having fun.